Summary of today’s show: Each year, the Office for Black Catholics celebrates members of the community who demonstrate strong, effective leadership and Scot Landry and Fr. Matt Williams sit down with the honorees this year, Fr. 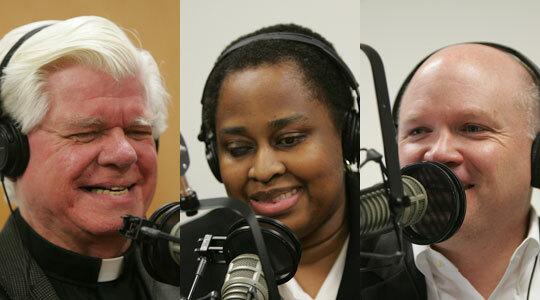 Gerald Osterman and Judge Antoinette Leoney, and Loran DesRoses from the office to talk about the awards and the particular concerns of the black Catholic community in Boston. 1st segment: Scot welcomed Fr. Matt back to the show. There was a Lift last night and the speaker was Oscar Rivera, a middle-school youth minister who graduated from Franciscan University of Steubenville. Oscar did some rap music and talked about the theme of “Get a Life” and being authentic with God. Fr. Matt also gathered with other graduates of the Good Leaders, Good Shepherds program of the Catholic Leadership Institute. It included priests from around New England. The program helps priests with tools to be a more effective leader. Cardinal Seán is being honored by the Catholic Leadership on Friday. Scot said the Bishop Healy and Robert Ruffin Awards will be awarded at a gala on November 19. 2nd segment: Scot welcomed Lorna DesRoses of the Office for Black Catholics and Fr. Gerry Osterman, pastor of St. Katharine Drexel in Roxbury and Immaculate Conception in Everett, as well as Judge Antonette Leoney. This is the 19th presentation of the Bishop Healy Award and the 9th presentation of the Ruffin Award. The Healy award remembers Bishop James Augustine Healy, the first African-American bishop in the US. He was born in Georgia in 1830 to an Irish farmer and a black slave. All of their children received their education out of the south. Three became priests. One of them was president of Georgetown. Lorna said Healy is controversial because he never publicly acknowledged his African-American heritage. He was a vicar general of the Archdiocese of Boston and a bishop of Portland, Maine. The award is given to a Catholic who exemplifies their faith in the community. Judge Leoney is the recipient of the award this year. She is a member of St. Katharine Drexel Parish and is involved in the Archdiocesan Black Catholic Choir. She is very involved in her parish. She is also an associate justice of the Massachusetts District Circuit Court. Judge Leoney said she is extremely humbled by this award. When she was told she was selected to receive the award, she was speechless. She said there are others who are more worthy than her and Lorna challenged her to tell her who they are. She has been singing in church for more than 20 years. Fr. Osterman said beautiful music lifts our hearts in liturgy and he said the judge helps him in his own chant during the Mass. He said the choir sends everyone home with lifted hearts. He said it is a great honor to have a parishioner to receive the Healy Award. He was overjoyed when Judge Leoney was recently appointed to the bench and now with this award. Fr., Matt asked her about her work as a judge and how her faith shapes her work. Judge Leoney said every day she thanks the Lord and says, “But for the grace of God, go I.” She sees so many people in bad circumstances and how throughout her personal life and professional life that Jesus has been the center of her life, helping to remain centered. There are days when she leaves work completely exhausted by the stories of the people who come before her and without Jesus as the center of her life, it would be difficult to do what she does. Before going on the bench, she was a federal prosecutor for 20 years and she started her day the same way. She comes from a modest background herself and is able to empathize and sympathize, even for people who have done wrong and she must sentence to jail time. She has been judge since September 10, 2010. Scot asked her what it was like to from in front of the bench to behind it. Judge Leoney said one of the reasons she became a prosecutor was her overwhelming desire to bring justice for people. In her heart and mind, her first priority is to get it right the first time. Having been a prosecutor for 20 years, she sometimes has a desire to jump down from the bench and do it herself. 3rd segment: The Robert Leo Ruffin Award is named after a prominent black Catholic of the 19th century who was involved in the Black Catholic Congress Movement. the award is given to those who serve in the black Catholic community and are dedicated to education, service, and the eradication of racial injustice. It is not awarded every year. Previous recipients include Fr. Patrick Waldron and Sr. Mary Hart. She said Fr. Gerry was selected by Cardinal Seán for his work in the parishes, with the St. Boniface Haiti Foundation, and the founding of the Mother Caroline Academy for girls in the Roxbury/Dorchester area. Fr. Gerry said he was surprised, honored, and humbled. Judge Leoney said Fr. Gerry is a pastor of two very different parishes that are geographically very separate, in addition to all his other work. She said doesn’t know where he gets the time and energy to do all he does, but every time he ministers, he does it well. He’s been involved in ministry in Roxbury and Dorchester for many years. Scot asked Fr. Gerry about being pastor of two parishes that are not contiguous. Fr. Gerry had been in the parish in Roxbury for 12 years and had been gone 10 years so it was a homecoming for him. It was difficult the first week, logistically, but it got easier as he fell into a routine. It takes about an hour to get from Everett to St. Katharine during the week, but he makes good use of the time. Making the journey is worthwhile because at the end of the journey is a warm and loving community of people who make him feel welcome. He began the St. Boniface Haiti Foundation. He’d been going to Haiti for about 30 years and they have a hospital in Haiti about 30 miles south of Port au Prince. The work there began as healthcare, but it’s moved into education. They are building a school in the area now. He said that nearly two years after the earthquake there isn’t much rebuilding yet, although the rubble has mainly been cleared. While much money has been pledged to Haiti, a lot of money has not yet been given. Oversight and building codes have slowed things down. He thinks it will be 20 years before Haiti recovers from the earthquake. Many Haitians are still homeless and living in tents and other temporary shelter. The Mother Caroline Academy in Dorchester is one of about 60 of them around the country based on the same all-girls model. It’s grades 5 through 8. They’re in school from 7:30am to 8:30pm with a break for supper at home. It’s like a private academy except they sleep at home. It becomes a family and the teachers are volunteers for up to three years. Fr. Matt asked how his current inner city ministry is different from his previous assignments in suburbia. Fr. Gerry’s first assignment was in the suburb of Wayland. He said it’s not all that different. The Gospel is the same. People may come from all different backgrounds and there is a lot of violence people live with every day which affects everyone and was usually connected to drugs. That made people from outside fearful of the community, but those who lived inside were mainly families in difficult circumstances who had the same hopes and desires as every one outside the city. He said St. Katharine Drexel is 90% black, and that’s a term he uses intentionally. It includes African-American, English-speaking Caribbean (most Haitians go to St. Angela’s in Mattapan), and Africans who are mainly Nigerian. He said the people blend easily among the different backgrounds. 4th segment: It’s time to announce this week’s winner of the WQOM Benefactor Raffle. Our prizes this week are Infinite Bandwidth: Encountering Christ in the Media , by Eugene Gan, and The Evangelization Equation: The Who, What, and How , by Fr. James A .Wehner. This week’s benefactor card raffle winner is Jean Chevry from Cambridge, MA. Congratulation, Jean! Scot asked Judge Leoney what people should know about Roxbury. She said they should know it is a community of beautiful people of deep faith, whatever the faith. There are wonderful things going on for young people, both within and outside of the churches. It’s also a very diverse community of African-Americans, Africans, Haitians, Cape Verdeans, Asians, Jamaicans, and Caucasians. She encouraged people to come visit and even patronize the restaurants. Fr. Gerry said the greater Catholic community is victimized by the press when it comes to the inner city because they only receive one side of the story. He said he often found reporters camped in the neighborhood waiting for something to happen and almost disappointed when it didn’t happen. They never tell the story of good young people who aren’t in trouble. he said the Church’s role is to make people more comfortable with being part of the community. Scot asked Fr. Gerry how he reaches out to the unchurched or lapsed Catholics in Roxbury. He said the Mass attendance is about the same percentage as the rest of the Archdiocese. he said there are many activities that bring people to the church hall, even if there aren’t formal programs. He said music is a very important draw for people. Fr. Matt recalled attending the Nigerian Mass as a seminarian and remembered the music and the liveliness and the appearance of the people. The Bishop Healy Award Dinner is going to be at Lantana’s in Randolph on November 19 at 6pm. Everyone is welcome to purchase a ticket and come to celebrate both Judge Leoney and Fr. Osterman and the black Catholic community.